PPCR has been involved with the Regeneration of Copley Close since 2016. The Copley Close regeneration is part new build and part refurbishment. As independent Resident Advisors PPCR play a crucial role to engage with all sectors of the community, to provide support and independent advice to local residents to enable them to play a key role in the regeneration process. PPCR work to ensure that the community are provided with clear and timely information at all stages of the Regeneration process. PPCR give training to interested residents to enable them to fully participate in the negotiation process between tenants, home owners and the council to ensure that all parties are working together in partnership . 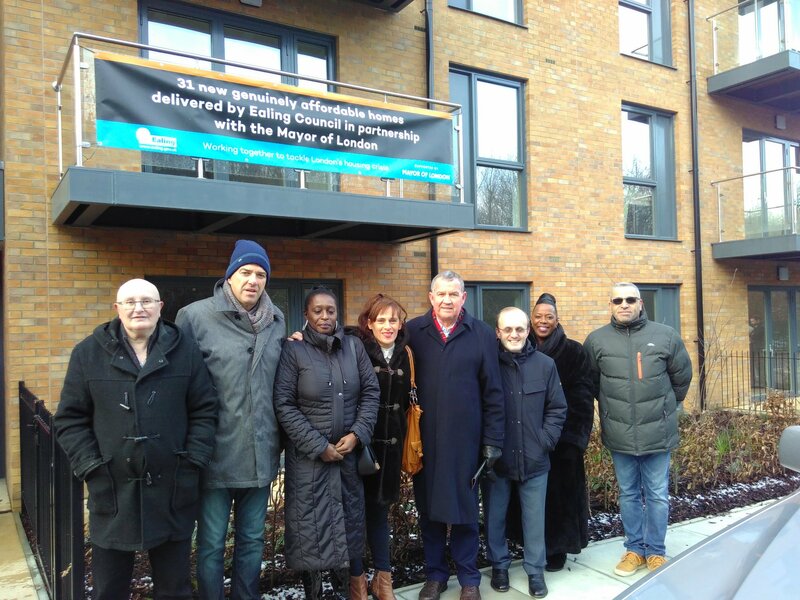 On Wednesday 23rd January, Mayor Sadiq Khan paid a visit to Copley Close. He visited the newly build Darlington Court, part of Phase 4 regeneration. There are 6 phases in total. The Building was completed in December and to provide 31 homes for rent to council tenants. Four families moved to the new build before Christmas and the moving process is expected to be finished by the end of the month. The Mayor first visited the marketing suite where he met with the Resident Association members and Janet Edwards from PPCR. The group walked up to Darlington Court to meet and talk with the new householders. This was the perfect photo opportunity for all. Darlington Court is part of the Mayor plan to deliver 1,000 new social rent homes being built by Ealing Council as part of the Mayor’s council home building programme. These flats are the first new council homes completed in Ealing since the Mayor announced last October that he has awarded the Borough a grant of nearly £100 million. This entry was posted in Copley, Hanwell W7, London Borough of Ealing, Our Current Projets. 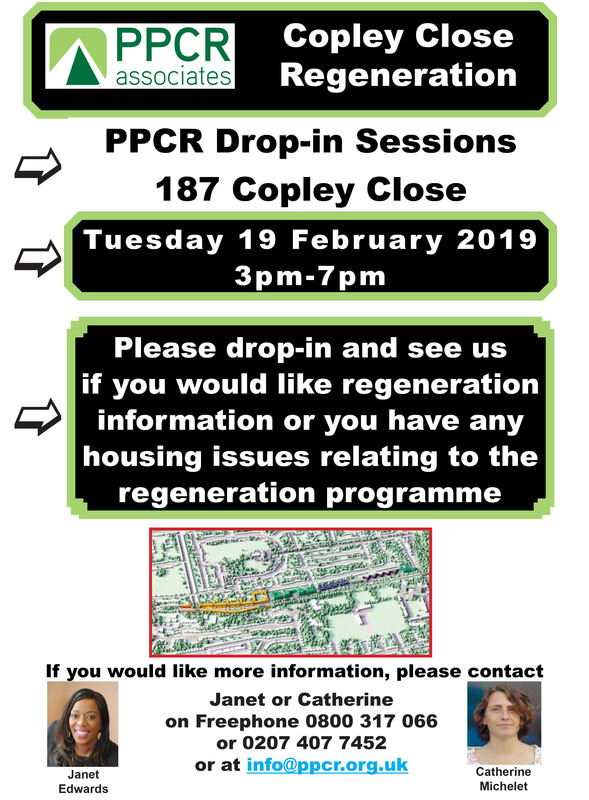 Please come and see Janet and Catherine at the Base, 187 Copley Close (next door to the Nisa shop) if you require information, advice or support about the Regeneration of Copley Close, or if you have any issues about your housing. Janet and Catherine will be there to help you between 3pm and 7pm on the 3rd Tuesday of the month. The next one is on Tuesday 19 February. On Saturday 28th January, members of the Copley Residents Steering Group gathered at the Holiday Inn in Kensington to discuss their vision for the regenerated estate. Lead by Amanda and Abraham from PPCR, the group worked hard throughout the day to create a common vision for the estate. To implement the vision they discussed how to influence the regeneration, and created a strategic approach. At the end of the day, they refined the vision and set out a mission, goals and milestones for the year ahead. They talked in details about which types of homes, gardens, green spaces, landscaping, spaces to socialise, community spaces, mentoring, leisure, children playgrounds, local shops, public transport and parking they would like to see developed on the Estate for the whole community. They also discuss a business model to make all this possible and viable in the long term. Copley has a diverse cultural background, every one needs to feel included, different cultures, young and old, families and singles need to feel part of the Copley Community. It was a very productive day for the Steering Group Members. The group worked well together. The next steps will be highlighted in the next Newsletter. Here are some photos of the Steering Groups members at work. You will be happy to know the 2nd Copley W7 Steering Group Newsletter is on its way ! – it is currently being drafted – so watch this space for the up-to-date news about what the Steering group has been up to and how they were able to influence the regeneration on your behalf. Would you like to make an impact and help create an estate you can all be proud of please join in to help to get the best deal of the Regeneration ? What sort of place do you want Copley, Hanwell W7 to be? 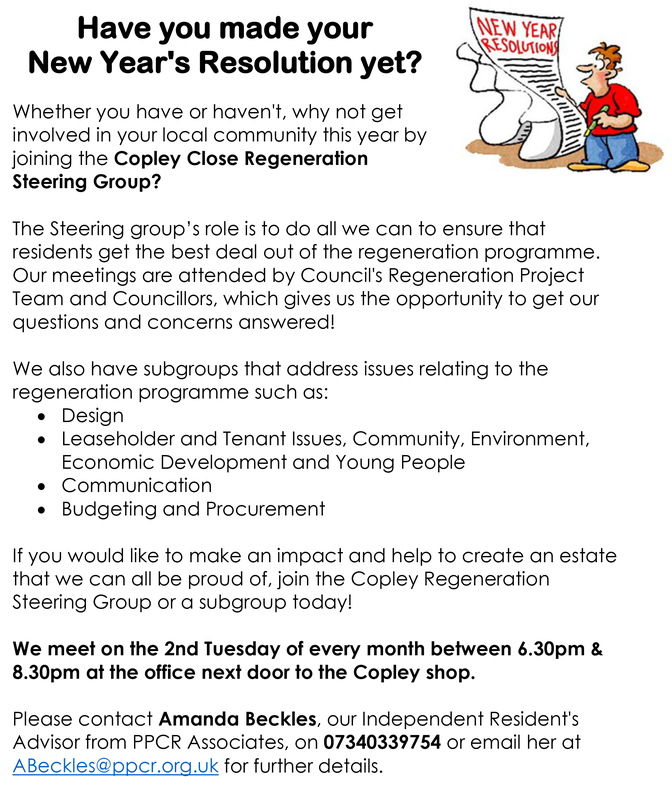 Please click on the link below to complete the Copley Estate survey. The survey will help us to start getting an accurate picture of what you think of where you live and what you would like to see improved as well as the building improvement works. All questionnaires are confidential. The survey is being conducted by PPCR who are registered under the Data Protection Act. This makes it illegal to pass on details about any individual without prior consent. The residents Steering Group and Ealing Council will only be given totals and statistical results. Over the next two months we’ll be inviting all households on the estate to take part in discussions about issues that matter to you most – such as places for children to play, litter and rubbish, safe car parking, and things for young people to do.